Please Note: You Must Answer Every Question! "A great relationship that is definitely on-track right now... Congratulations!" That being said, just because it's great right now, that doesn't mean that it will stay that way... Based on my work with thousands of couples, even couples with relationships like yours can suddenly find themselves struggling. And this happens for surprising reasons—because of well-intended things that one or both of you might do to try to keep the relationship happy, and to please each other. And believe me; without even realizing it, these things can make things much worse over time. So how can you keep your relationship great? 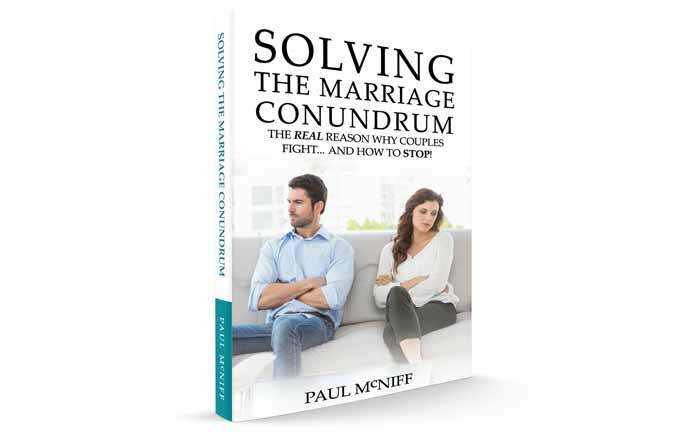 I've just published a book called: "Solving the Marriage Conundrum". It's all about helping couples, just like you, to understand what they're probably doing that can get in the way and make things worse between them. Now I don't know you personally, so of course I'm not saying that your relationship will get like that. But based on my own experience with a huge number of couples, when you know what CAN get in the way, you can prevent that from affecting you badly. "An okay relationship that could do with some help and support to allow you to feel great!" Your relationship isn’t in a bad state right now. Although, that being said, it could definitely be better. You could feel more supported, valued, loved and satisfied. And the good news is that, based on your answers, I see a lot of potential for you as a couple to quickly and easily create a much more satisfying relationship, if you want to work on it a little bit. Can you turn your relationship around? Yes—Absolutely!!! In fact, many of the couples that I work with have relationships that are similar to yours. So you definitely can! But here's the thing; If you want to create an amazing relationship… then you need to do something different soon! Because if you don't do anything, things are likely to get even worse over time. "A challenging relationship that needs a fair bit of work and attention to allow you to feel great!" It sounds like there are a few areas where you don’t feel nurtured, or satisfied... or comfortable? And chances are that your partner doesn't either. But here's the thing; people who have relationships like yours often give up and end them way too early. And even though I'm not one of those Therapists who believes that all relationships should work—definitely not!—I do believe that many people give up much too soon... and they often end up creating a very similar relationship with someone else down the track—simply because they didn't realize what THEY were doing that contributed to the relationship not working well. So they do it again in their future relationship. Can you turn your relationship around? The simple answer is: Yes!!! do the simple, yet highly effective things that can help you and your partner to take back your power and restore balance... both in yourselves, and in your relationship. Over the years I've helped many couples with relationships like yours to: get past their issues; rebuild their connection; and turn things around completely. In fact, most of these couples end up telling me that their relationship is better than it EVER was. So yes, there's definitely hope for your relationship if you want it. But of course, if you "want out", or if you don't want to "do the work", then walk away. But before you go, make sure you know what YOU have been doing that has contributed to how things are, or else you risk creating a similar relationship with someone else down the track. How much fun and laughter do you enjoy on a regular basis as a couple? How much conflict do you experience between you? How well do you actually RESOLVE, or get past the conflicts that you have in your relationship? What level of anger or rage (loud or big expressions of anger) are there in your relationship arguments? As a couple, how much do you believe you have in common in this area? How would you rate your ability to feel safe and secure when you’re with your partner? When I'm with my partner I get to just be "me", rather than having to pretend or be "nice"
Which is the MOST accurate sentence about how you feel in your relationship? After one of you apologizes what happens? How would you rate your likes and dislikes in terms of socializing and going out? How would you rate yourselves as friends? Are you allowed to want to change each other at all? What are your expectations around fighting and conflict in a relationship? How happy are you both with the way that you share the chores and tasks that need to be done?